Our group’s research has found the house to have been built in the early 1800s on land that was then known as the W. Wilson Farm. 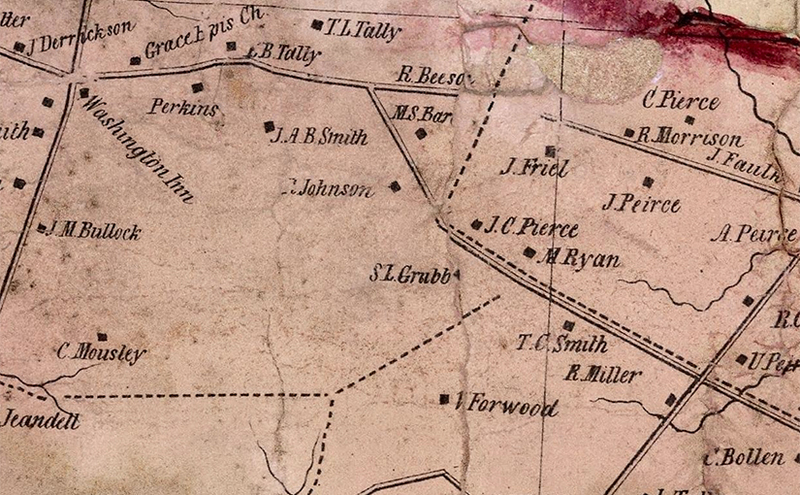 It is shown on this 1849 map belonging to Robert Johnson. It was owned by the Day family from around the time of the Civil War until World War II. A report by the New Castle County Historic Review Board describes the property as one of the, “mid-19th century landscape features that once dotted northern New Castle County”. The report goes on to describe the property as “a rare intact farmstead in Brandywine Hundred … an example of the early development of the Hundred, before the suburbanization that occurred in the 20th century.” It is particularly notable in the area because it is an original county farmstead that is also still attached to its land, which is used for dairy farming by Hy-Point Farms to this day. Even the construction of the house is distinct. The older original wing of the house is made of stone on three sides and frame construction of the fourth—an unusual technique. It gets its name from Francis and Eleanor Jester who owned the property from 1953 to 1974.